Jean-Paul Laurens (1838–1921), The Death of Cato the Younger (of Utica) (1863), oil on canvas, 158 x 204 cm, Musée des Augustins, Toulouse, France. Wikimedia Commons. Another, perhaps the other, great figure of classical times who is prominent for the moment of his death is Cato the Younger. Plutarch’s Lives also contains an account of his great-grandfather, referred to as Cato the Elder. Marcus Porcius Cato Uticensis was orphaned when a child, and brought up by an uncle. From childhood he was inflexible and steadfast if not stubborn, and developed great ambition. When he was educated, he proved a slow learner, but what he did learn stayed put. He followed a Stoic philosophy, being made a priest of Apollo and living a simple life. He seldom spoke in public, and when he did, he was straightforward and direct. He considered that life at the time was bad and in need of great change, so generally chose the opposite course to what was then in fashion. He volunteered for the Third Servile War, led against Rome by Spartacus, for which he was proposed honours, but he refused them as he declared that he had not earned them. He was then appointed military tribune, and sent to Macedonia. On the journey there, he walked whilst his attending slaves, freedmen and friends rode on horseback. While there in command of a legion, he conducted himself as a soldier rather than as a general, which earned him great respect from those under his command. On completion of this tour of duty, he travelled in Asia before returning to Rome. Before he would accept the office of quaestor, he insisted on learning all about its laws and practices. Once installed in office, he was assiduous in ensuring that his staff conducted themselves correctly too, expelling one for breach of trust, and bringing another to trial for fraud. This restored confidence in his office, and brought more honesty to the handling of public finances. Cato was then elected a tribune, and started trying to tackle the widespread problem of bribery. He spoke in the senate against Caesar, alleging that he was trying to subvert the state. Cato was also a strong opponent of Pompey, and gave a vehement speech in which he declared that, while he lived, Pompey should not enter Rome with an armed force. These were dangerous times in Rome: armed strangers would appear at key points in the city, and Cato once physically put himself between Caesar and Metellus to stop them from conspiring. Metellus introduced a proposed law to bring Pompey back to Rome, which Cato steadfastly opposed. When the supporters of Metellus were convinced that Cato’s opposition would succeed, Metellus fled to Asia, intending to go to Pompey there. Pompey then returned to Rome, demanding that the consular elections be postponed. Cato persuaded the senate to refuse that, so Pompey decided to win over Cato to be his friend. Pompey sent Munatius, Cato’s companion, to Cato with the proposal that Pompey and his son marry two of Cato’s relatives (either nieces or daughters). Cato refused to be won over in this way. Unfortunately this drove Pompey to unite his power with that of Caesar, again by way of marriage, which nearly overthrew the whole Roman state. Cato continued his opposition to the schemes of Pompey, and opposed Caesar’s request to be a candidate for the post of consul while still celebrating a triumph on his return from Spain. Caesar abandoned the triumph, was elected consul, and gave his daughter in marriage to Pompey, bringing Rome closer to the brink of constitutional collapse. Although Cato retained the support of the senate, and of many outside it, his opponents won the day by violence. The senate therefore passed a law distributing lands, to which Cato remained strongly opposed. That law also required the whole senate to take an oath to uphold the law, something which Cato refused to do. Caesar introduced another law to divide most of Campania among the poor and needy, which only Cato opposed. Caesar had him dragged off to prison from the senate. Caesar then experienced remorse, and had Cato released, only for the latter to oppose Caesar again over the proposal to make Caesar governor of Illyria and the whole of Gaul. Cato sailed to Byzantium, and from there to Cyprus, where he sold off the estate of Ptolemy, the late king of Egypt, for cash. Bringing the money and two books of accounts back to Rome proved a tough challenge, and both books were lost in transit. Cato was annoyed at that, as he wanted to be able to provide full account for the great treasures which he had brought back. By this time, Cicero had returned from exile, and promptly destroyed the records of the tribuneship of his enemy Clodius. Cato fell out with Cicero as a result. Caesar, Pompey and Crassus then joined forces to arrange for Caesar’s rule over Gaul to be renewed and funded, and to promote Pompey and Crassus as consuls. Lucius Domitius, Cato’s brother-in-law, stood against them, and he and Cato were attacked by Pompey’s men early one morning in Rome, forcing Domitius to withdraw from his candidature. 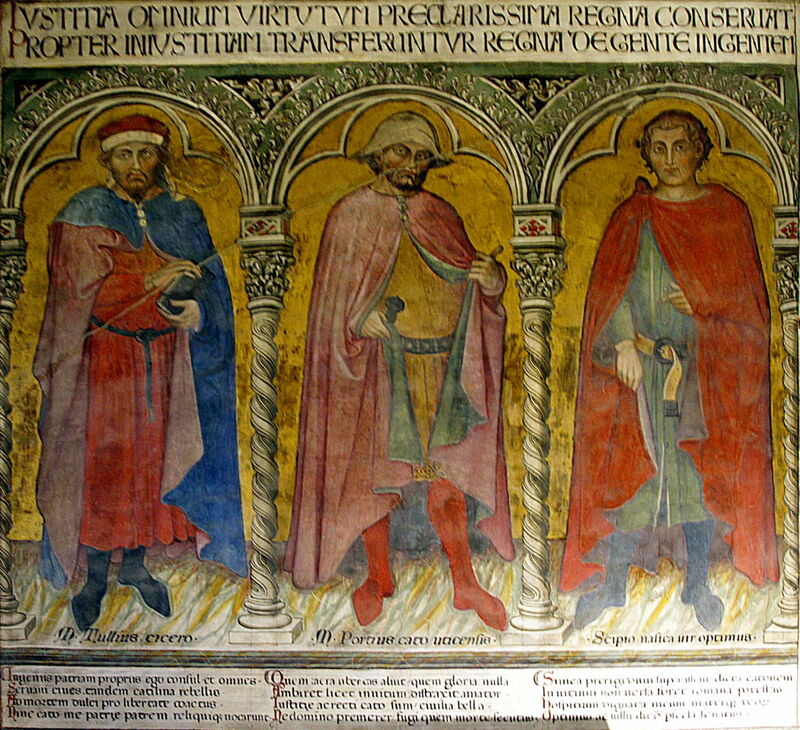 Taddeo di Bartolo (1362-1422), Cicero, Marcus Porcius Cato the Younger and Publius Cornelius Scipio Nasica (date not known), fresco, dimensions not known, Palazzo Pubblico, Siena, Italy. Image © José Luiz Bernardes Ribeiro / CC BY-SA 4.0, via Wikimedia Commons. Taddeo di Bartolo’s fresco of Cicero, Marcus Porcius Cato the Younger and Publius Cornelius Scipio Nasica from about 1400 still stands in the Palazzo Pubblico, in Siena, Italy, showing those Romans of this time who fought for justice. Cato wouldn’t give up the fight against Pompey, though, and put himself forward as praetor. By manoeuvring and bribery, Pompey and Crassus got another candidate elected instead of Cato. The senate then considered a proposal to assign provices to the consuls, against which Cato tried to speak. After two hours of putting his arguments, he was pulled down and ejected from the senate, which eventually led to fighting in the forum. The following year, Cato was elected praetor, but seemed to be in decline, often attending his tribunals without shoes or a tunic. He persuaded the senate to pass a law which required magistrates to furnish accounts of their election, in an effort to end the bribery which was rife at the time. This unfortunately led to rising irritation with Cato, and made those in power hostile towards him. With government falling more deeply into disarray, Pompey had himself made sole consul by the senate. Pompey asked Cato to meet him, and invited him to be his counsellor and associate in government. Cato replied that, while he was happy to be his counsellor, he would continue to speak his mind in public. Caesar was using the riches which he was winning in Gaul to buy himself increasing power in Rome, which Cato drew to Pompey’s attention. The latter wouldn’t respond to this growing threat, so Cato stood for the consulship, so that he could check Caesar’s rise. He was unsuccessful, and could only oppose Caesar’s actions in the senate, whose members were too afraid of Caesar’s great popularity to do anything. Cato urged the senate to put Pompey in charge of addressing the situation with Caesar, but Pompey was without an army, so left Rome. Cato then went in pursuit of Pompey, bearing heavily the sorrows of his country. He stopped trimming his hair and beard, and refused to wear any garlands of flowers. Cato was then despatched to Asia, where Pompey’s commanders had no need of him. By this time, Pompey had assembled a great fleet of ships and a large army. Instead of making Cato his admiral, Pompey chose Bibulus, because of Cato’s devotion to Rome. Cato was put in charge of the garrison he had assembled at Dyrrhachium. Pompey was then defeated at Pharsalus, and fled. Cato sailed to Libya, where he learned of Pompey’s death. This left Cato in command of the forces in North Africa. Scipio then assumed overall command, and wanted to please the African king Juba by killing all the citizens of Utica, which was thought to have swung towards support for Caesar. Cato strongly opposed this, and helped Utica to defend itself. Caesar then won a battle at Thapsus, and the defeated Scipio and Juba were among the few who had escaped. Cato advised the citizens of Utica to defend themselves against the forces of Caesar, but their senate decided instead to sue for peace. With his world falling around him, and Caesar’s army approaching, Cato bade the citizens of Utica farewell, as if he was going to leave them. He then took a bath, after which he sat at supper with friends. He retired to his room, where he read Plato’s On the Soul. He looked up for his sword, which had been removed while he had been eating, so summoned a servant to fetch it for him. His son and friends had by this time recognised that Cato intended to end his own life, and Cato had to insist, quite angrily, that he was of sound mind and capable of making his own decisions. His friends finally withdrew, and his sword was brought in to him. 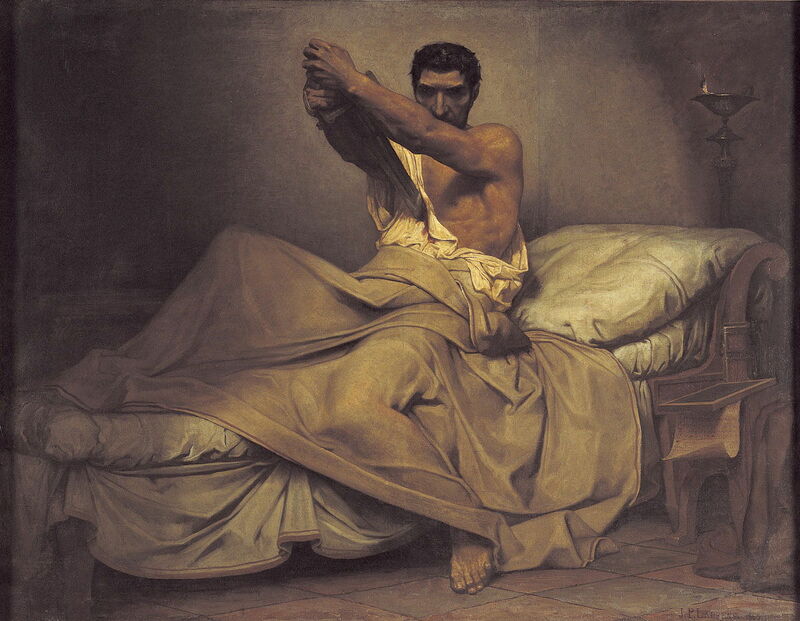 Towards dawn, Cato drew his sword and stabbed himself in the abdomen using a hand which was inflamed and weakened. This failed to kill him, but he fell from his couch and overturned a nearby abacus. His son and friends ran in when they heard the disturbance, and found Cato covered with blood, most of his bowels protruding, but still alive. A physician went in and tried to repair this, but Cato pushed him away and tore at his wounds until he died. The citizens of Utica honoured him in death, burying his body near the sea. He was only forty-eight. Cato’s daughter was the wife of Brutus, who two years later was one of those who killed Caesar. 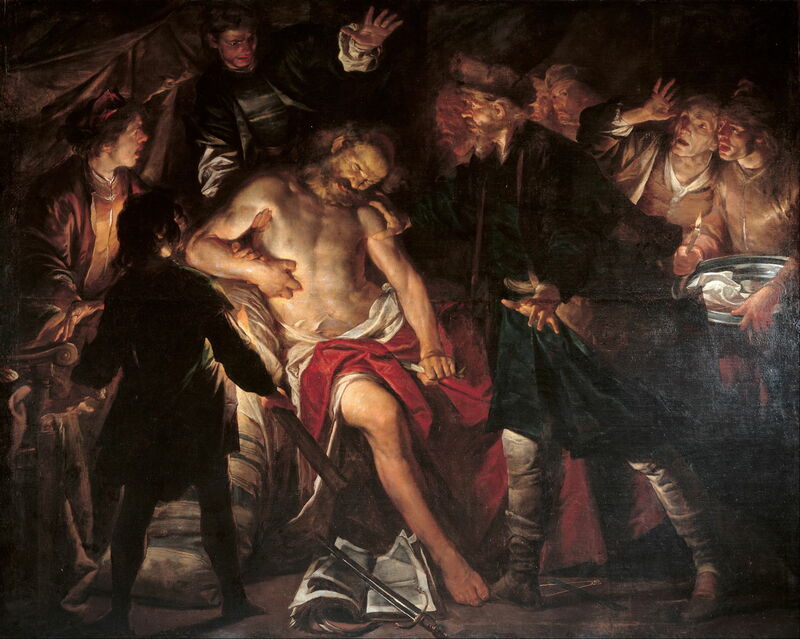 Gioacchino Assereto (1600–1649), The Death of Cato (c 1640), oil on canvas, 203 x 279 cm, Musei di Strada Nuova, Genova, Italy. Wikimedia Commons. 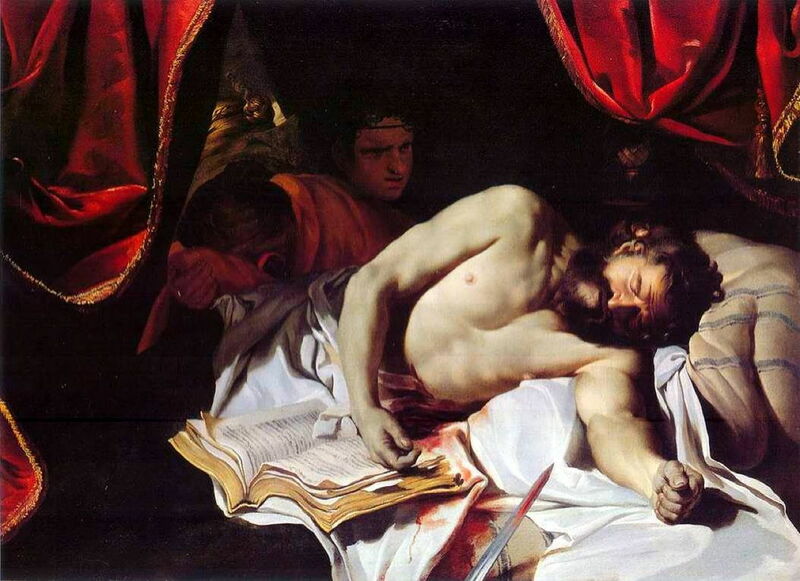 Cato’s gruesome suicide has long been a favourite subject in painting. In about 1640, Gioacchino Assereto, a Genoese Caravaggist, painted The Death of Cato, showing the physician attending, and delicately avoiding gore. Cato’s right hand is clearly injured, and his left pulls at a cloth as his face contorts with pain. Charles Le Brun (1619–1690), Suicide of Cato the Younger (c 1646), oil on canvas, 108 x 147 cm, Private collection. Wikimedia Commons. 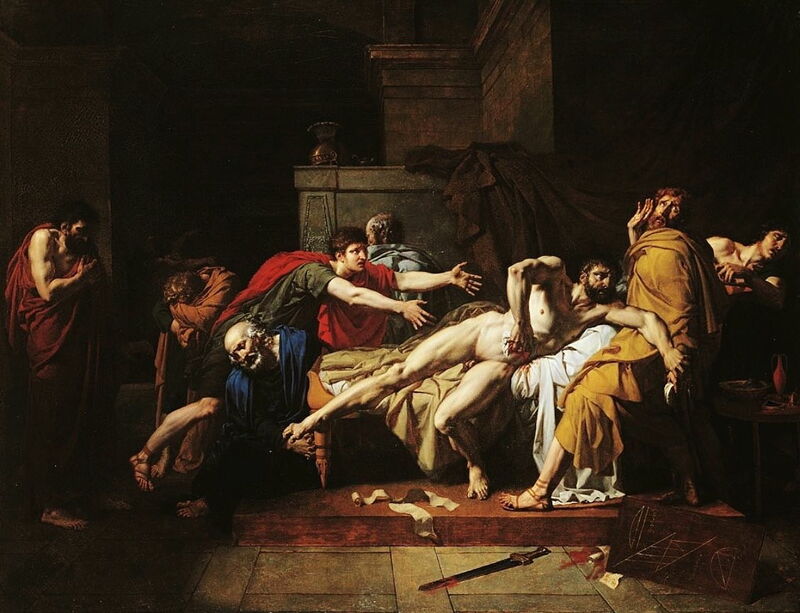 A few years later, Charles Le Brun painted the Suicide of Cato the Younger (c 1646). This doesn’t appear to follow Plutarch’s account particularly well: although he appears still undisturbed, his eyes are closed and he appears to be dead, still in his bed. Antonio Molinari (1655–1704), The Testament of Cato Uticense (date not known), oil on canvas, 151 x 195 cm, location not known. Wikimedia Commons. Later in the seventeenth century, Antonio Molinari painted The Testament of Cato Uticensis, which must show an earlier scene when a servant has just brought him his sword. With the Reign of Terror only past some three years earlier, I think it suprising that Cato’s suicide was chosen as the subject for the prestigious Prix de Rome competition in 1797 – the first time that it was held since 1792. This was one of only three occasions in which the jury decided to award three equal first prizes, to Louis-André-Gabriel Bouchet, Pierre Bouillon, and Pierre-Narcisse Guérin. 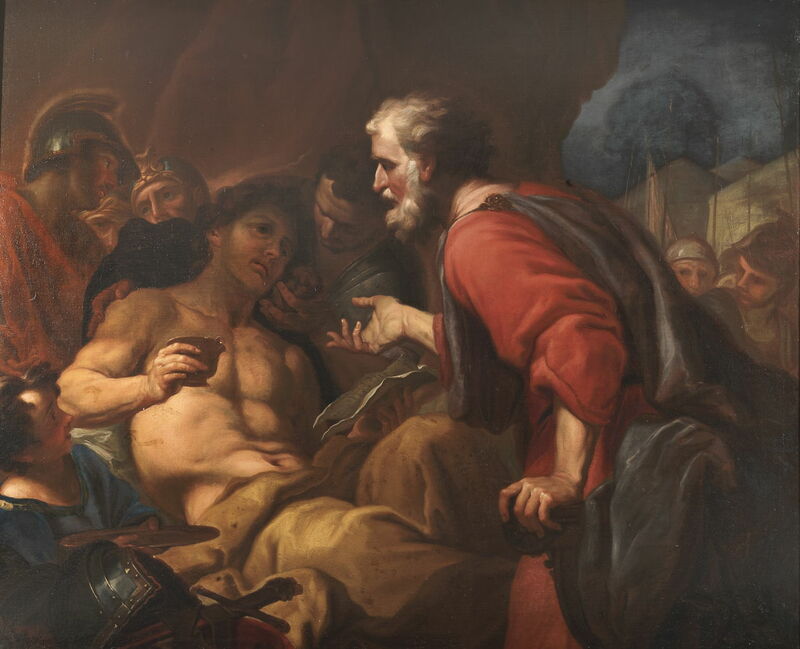 Louis-André-Gabriel Bouchet (1759–1842), The Death of Cato the Younger (of Utica) (1797), oil on canvas, 114 x 144.5 cm, Ecole nationale supérieure des Beaux-arts, Paris. Wikimedia Commons. Bouchet’s entry is skilfully composed, and employs a strong diagonal formed from outthrust arms bringing the gaze onto Cato’s injured abdomen. Although a powerful moment, it lacks references to preceding or successive events. 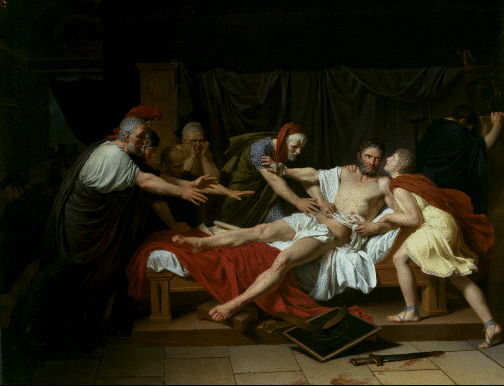 Pierre Bouillon (1776-1831), The Death of Cato the Younger (of Utica) (1797), oil on canvas, 123 × 163 cm, Musée de Tessé, Le Mans, France. Wikimedia Commons. Bouillon uses Cato’s outstretched form to make another strong diagonal, but is less directive of the gaze, and less structured altogether. It’s hard to know exactly which moment in the story he is showing us, and the geometric diagrams in the lower right corner are frankly confusing. 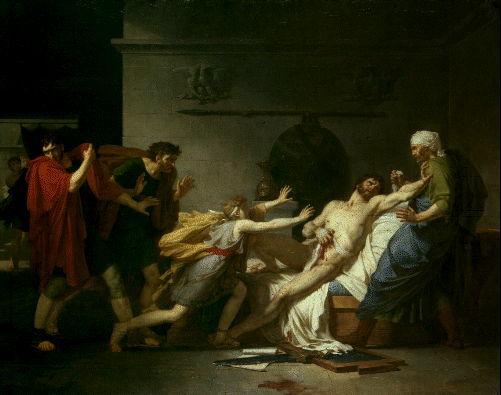 Pierre-Narcisse Guérin (1774–1833), The Death of Cato the Younger (of Utica) (1797), oil on canvas, 113 x 145 cm, Ecole nationale supérieure des Beaux-arts, Paris. Wikimedia Commons. Guérin has outstretched arms leading us not to the wound, but to Cato’s head, and he in turn fending the physician away. The two figures on the left don’t appear to contribute a great deal, and the narrative is little clearer. It wasn’t until 1863 that the young Jean-Paul Laurens tried a different approach which I think proved most successful. In this earlier moment of the story, Cato is trying to sink his sword into his belly, when quite alone. In these more recent depictions, the great strength of this story lies in Cato’s refusal to compromise his high values: something of great importance in France at the time of the Directory in 1797, and again under Emperor Napoleon III in 1863. It also seems a timely reminder in 2018. Cato the Younger, whole text in English translation at Penelope. Posted in General, Life, Painting and tagged Assereto, biography, Bouchet, Bouillon, di Bartolo, Guérin, Laurens, Le Brun, Molinari, narrative, painting, Plutarch. Bookmark the permalink.